Sometimes when people are sick their need for love, support and attention just don’t go within what most understand as normal. They need a lot more. Unfortunately, not all people have the time or the patience to deal with people who are sick, ill or disordered. However, dogs when well-oriented to dog therapy training could augment the emotional and physical support that most people could not provide. Therapy dog training require specializations that are rooted on fundamental dog training. As such, training for this work entails the need to form behaviors in the dog that are of great help to people who are undergoing therapy. Therefore, basic dog training will not suffice if the dog needs to demonstrate other obligations like performing various roles and interacting well with the patient. 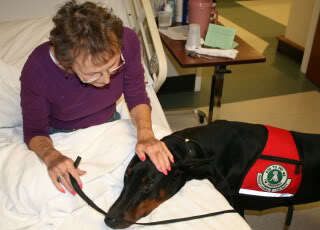 Therapy dogs are used in hospitals were mostly the patients are the children and the elderly. The handler and the dog will provide the patients with sufficient attention and activities that will let them drift away from the present problems in their lives. However, therapy dogs are not only valuable in hospitals, the comfort they give are also necessary components in other therapy centers like nursing homes, schools, mental institutions and retirement homes. The type of training that therapy dogs undergo are especially created and modified from various other trainings to fit the needs called for in situations that usually occur during hospital visitations. Their training will equip them with the appropriate skills to allow strangers to enjoy their company. To provide enjoyable experiences, most therapy dogs are trained to do tricks and performances that the audience will enjoy. Most dog breeds could undergo therapy training. However popular choices for training include breeds that have high temperance since they have to work with people that they are not familiar with. Training of therapy dogs vary from state to state however, it is general rule that a therapy dg should have certification of good citizenship before it can enter into the formal training and service. Certification as well as training could be obtained from local therapy dog training classes or animal shelters. After obtaining this certification, therapy training for the dog will begin. This kind of training will condition the dog to ignore things like hospital equipments, people who are not the subject of therapy and noise. They are also trained to help with basic tasks like simple activities. However, they must not be confused with service dogs. These are the dogs, which are under the law, help people who have disabilities. More often than not, they work on a continuous basis. Therapy dogs are more like visitors to patients and not really dogs that will accompany and help people with disabilities with their daily tasks. A visiting dog will also help in changing the routine from time to time. Therapy could be quite boring for many people thus the need for change of pace will always contribute something positive to the therapy. Animals could also make the patient feel less depressed or lonely since they create distractions from the unproductive thoughts of the patients. Dogs could also encourage the patient to become less passive and more responsive and active during and after visitations. Therapy training will also help the dog entertain the patient; they may either provide fun or diversion from the pain and suffering currently experienced. Therapy dog training is relatively unpopular but the services of the dog for this purpose have been used for so many years.